In our pursuit of clean, renewable energy, wind turbines seem to always take a backseat to solar energy. We’re constantly looking into new ways to harvest the Sun’s energy, but what can you do with something that is essentially an oversized fan? A French eco-energy company named Eole Water has developed a new wind turbine that can collect wind energy and fresh water from thin air. The company’s WMS1000 wind turbine can condense water vapor from even the most arid weather conditions and produce gallons of drinkable water. Eole Water’s reinvented turbine looks and works like a regular wind turbine that can generate 30 kilowatts of electricity. However, in a separate process, the turbine takes wind into its body and forces it through a cooling compressor like the ones found in an air conditioner. As the wind passes through the turbine, it’s cooled by the compressor, which draws the water vapor out the air. The water condenses into water droplets that drip down through a series of stainless steel tubes. From there, the water runs through a filtration and purification system that’s powered entirely by the turbine. It’s a great self-sustaining system. Eole Water currently has a working prototype installed in the desert region just outside of Abu Dhabi in the United Arab Emirates. The wind turbine can pull an average of 62 liters (16.3 gallons) of water per hour from air with an average humidity of 45 percent and temperature of 24 degrees Celsius (around 75 degrees for us fahrenheit-using folk). 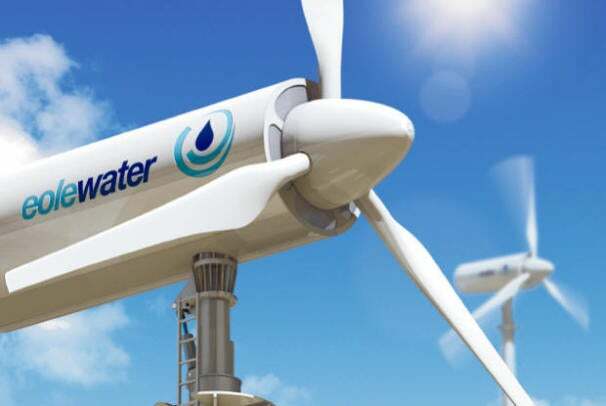 The company says that a single turbine could potentially pull 1,000 liters of water per hour in favorable weather conditions.